Like crazy people, Mike & I thought it would be fun - fun! - to take my cat, Helo, to my mom's house so that he could meet her dogs, Jed & Chyna. Actually, it was sort of fun, although Helo was mostly confined to the guest bedroom because Jed was dead set on eating him. I did take Chyna, the nicer of the two dogs, in to visit him a couple times, & they became fast friends - or at least OK acquaintances. Nothing is cuter than watching a cautious cat & an excitable dog play a nervous game of hide & seek. Helo does pretty well in his carrier, & he doesn't seem to mind riding in the car. On the drive to my mom's house, in fact, we let him out so he could explore a bit, & he propped his paws on the back window so he could watch the world go by. On the way back to Cleveland, though, Helo seemed uncharacteristically agitated. He was meowing at the top of his tiny cat lungs, trying to force the carrier open with his claws & his head, smashing his face against the clear plastic lid. We laughed it off, thinking he was just exerting some newfound confidence after having faced down a dog & survived. Except then he went quiet, & I realized that he had been trying to get out of the carrier... because he had to pee. And when he couldn't get out, he peed in his carrier. And all over himself. So, uh, how do you wash a pee-soaked cat??? After much laughing & a little bit of panicking, I decided to leave Helo in the carrier & just put the whole thing in the bathtub. My handheld showerhead, which is super-annoying when I'm trying to shower, served as my blessed weapon of choice in this war. I turned on the water & directed the spray right into the cat carrier, & though I fully expected the cat inside to lose his mind, he didn't so much as meow. I think he wanted the shame washed off of himself just as badly as I wanted the smell of urine washed off of him. After a minute or so of hosing him down, I opened the carrier to find the saddest sight I've seen in a long while: a sopping wet medium-haired cat, peering up at me with his eyes wide & his fur heavy against his body, looking demeaned & ashamed & sad as hell. I tried to catch him in a towel to dry him off, but he was too fast for me; he shot out of the bathtub like a bat out of hell, sloshing water all across my hardwood floors as he ran. 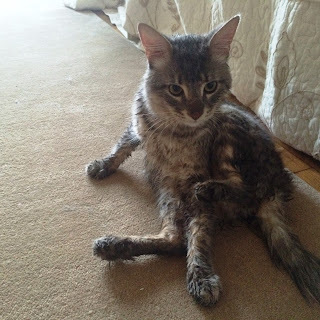 We caught up with him in the living room, where he stood dripping wet & more than a little undignified. When I caught him, his body seemed to sag against me, defeated, & he let me wrap him in a towel like a human child. Did I mention that I had stripped down to my skivvies in order to try to give my cat a bath, lest he attempt to destroy everything around him upon making contact with the water? So just imagine the scene: Me, half-naked & laughing hysterically. My cat, sopping wet & totally pathetic. My apartment, covered in wet paw-prints. And my boyfriend, filming the whole thing. Needless to say, I haven't laughed that hard in a long time.